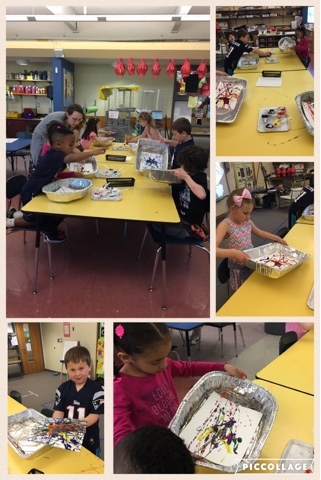 Ms. Nasser's Art Studio: Marble Painting Madness! We're manipulating paint in the kindergarten art room! We discussed all the different tools you can use to paint in art class this week. Tools like brushes, forks, hands, fingers, feet, and MARBLES!! We used marbles to create an abstract splatter design. These young artists practiced controlling the direction of the marble and the marks it made by how slowly or quickly they tipped their tins. They had so much fun! Check out a few video's of this fabulous marble painting process. Check back next week to see what these marble paintings will be used for!